Rooted in God's Grace to joyfully witness and serve. Mount Cross is a Christian church. We exist as a Christian congregation because we have been called together by God's Spirit and given the task of sharing with others the life saving Good News of the Savior, Jesus Christ. Mount Cross is also a Lutheran church, which means we are part of a tradition of worship and teaching that goes back to Martin Luther. We have the word cross in our name to help us remember how we are called to live. 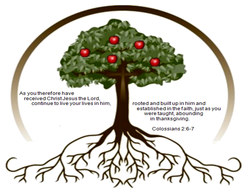 We live in confidence that Jesus has restored our connection with God (the vertical dimension). We live in service to others (the horizontal dimension). More praising in prayer for our family Mt. Cross! Development of ways to involve kids in music at our worships - e.g. children’s choir or participation in bell choir!